Essential fatty acids (EFAs) are healthy fats that cannot be made naturally within the body and must instead be obtained through food. They are needed in order to produce vital omega-3 and omega-6 acids. There are two EFAs: these are alpha-linolenic acid (omega-3 fatty acid) and linolenic acid (omega-6 fatty acid). There are many types of fatty acids that are needed by the body, however since these are the only two that the body cannot produce on its own, they are referred to as ‘essential fatty acids’. The difference between the two lies in their chemical structure and their different roles within the body. It’s important to ensure that you consume the right ratio of these EFAs in your diet, as having too much omega-6 fatty acids can inhibit the function of omega-3 acids. Generally speaking, the recommended ratio of omega-6 to omega-3 is 4:1, however the Western diet tends to be higher in omega-6, making it important that you ensure you are eating the right amount of both EFAs. EFAs can help to promote glowing skin. In order for cells to stay healthy, they need to stay hydrated and these fatty acids play a vital role in helping your cells to retain water and flush out toxins. EFAs can also help counteract oily skin, as they help the transference of cells, which in turn flushes out the oil clogging up your pores. Not only this, but they can also help to counter dryness in the skin – perfect if you suffer from mild eczema. EFAs are also believed to help prevent heart disease. Omega-3 has been shown to reduce blood pressure and increase levels of high-density lipoprotein (good cholesterol), while omega-6 acids are believed to lower cholesterol and may decrease the risk of coronary heart disease. Research has suggested that EFAs may help to alleviate joint pain, such as arthritis. Eicosapentaenoic acid (EPA) and Docosahexaenoic acid (DHA), types of omega-3 fatty acids, help to reduce inflammation, which is what causes swelling and consequently pain. Alpha-linolenic acid (omega-3 fatty acid) leads to the creation of Eicosapentaenoic acid (EPA) and Docosahexaenoic acid (DHA), which are particularly important for helping to maintain brain function. These fats help to increase the fluidity of cell membranes in the brain, which helps the cells to function and consequently enables the brain to function at its optimum level. Omega-3 fatty acids also help to aid the function of the chemicals in your brain that communicate information throughout your body and brain. In order to fight off infection and foreign diseases, the body requires cells known as lymphocytes. Omega-3 has been shown to increase the number of these cells in the body, therefore enabling the body to fight off disease more effectively. Research suggests that omega-6 may also contribute to weight loss, as it affects the hormones leptin and resistin, both of which affect appetite and the storage of fat in the body. This acid also helps to promote muscle growth by increasing the production of growth hormones. Flax seeds Flaxseed oil, also known as linseed oil, is a great natural source of omega-3 fatty acid. It can be incorporated into your diet easily, as it can be used as a salad dressing or in sauces and it can even be added to smoothies. Walnuts Walnuts contain a great deal of omega-6 which, when used sparingly, make them a great food to have as a snack or to add to meals. Try incorporating them into salads, porridge or yogurt. Oily fish Oily fish such as salmon, mackerel, sardines or anchovies, are all great sources of omega-3. Try making mackerel on toast or taking a can of tuna into work to eat as a snack. Chia seeds Chia seeds contain a great deal of omega-3, even more per gram than salmon! Chia seeds are relatively cheap to incorporate into your diet, as you don’t need to use very many; simply sprinkle the seeds or the oil on salads, yogurts or cereal. Almonds Not only are almonds a great source of manganese and vitamin E, they also contain a great deal of omega-6. Try adding them to your breakfast or consider buying almond butter. Frida Harju-Westman is a nutritionist with the app Lifesum (www.lifesum.com). Whether the goal is to lose weight, build muscle, or just live a healthier life, Lifesum shows how changing small, everyday habits can transform your life. The app is available on iOS and Android. 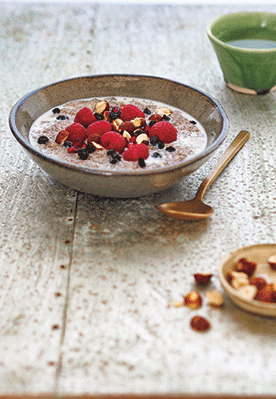 Chia is a great source of omega-3, which makes it the perfect choice for a hormone-balancing breakfast. This recipe is also useful for reducing inflammation and improving oestrogen levels. 1. Place all ingredients in a saucepan with 185 ml (6 fl oz/¾ cup) of water and stir continuously over low heat for about 5 minutes. 2. To serve, add the toppings and a drizzle of milk. Recipe taken from Healthy Hormones by Belinda Kirkpatrick and Ainsley Johnstone, (£16.99, Murdoch Books). Photography by Ainsley Johnstone.